I’ve been thinking about this town in a mall concept for quite a long time. It’s been years since I first wrote my original article on the idea. At the time, I didn’t know much about blockchain or cryptoassets, but then again, neither did anyone else. In fact, back in 2012, when I first wrote my initial article on a city in a building concept, the grandfather of all cryptocurrencies, Bitcoin, was only 3 years old. Now I have a body of writing on cryptocurrency and blockchain, and how it will impact our future. So I’d like to integrate all of these ideas together into one theoretical project. Those who use various blockchains and cryptoassets are tied together economically and socially. This is true, even with the very limited functionality of current blockchain architectures. As blockchain applications expand, and we begin to really use the technology to manage contractual agreements between individuals and groups, whether it’s through Agora Coin, or some other platform, a blockchain system will end up feeling more and more like a community. In the future, I predict that pretty much all social programs will be managed by blockchain systems. Universal basic income, if it is implemented in the world, will be implemented through blockchain. The same goes with universal health coverage, social security, and other programs. But like with current blockchain systems, there are bound to be disagreements, and those disagreements will result in forks or alternative systems, just as we saw Bitcoin give birth to Litecoin, BTC, and others. In a future world managed by blockchain, instead of changing citizenship, a person might simply change which platform they use. Users might need to keep using the old chain for certain things, like paying certain bills that are attached to the old system, but even then it’s likely that there will be a lot of interchain compatibility. It would be very similar to obtaining new citizenship and maintaining dual citizenship, only much more voluntary. If a person doesn’t like the kind of social programs being managed by one chain, they just stop supporting it. If they don’t like the tax rate (inflation rate), then they would choose not to use the cryptoasset associated with the chain. And if none of the blockchain systems fit what a person needs, or if they think there’s a better way of doing things, they can create a new system or fork an existing one. Some have even likened the forking of bitcoin and other blockchain systems to civil wars. And in many ways, there’s a lot of overlap, only again, its all voluntary! One question I have about this future is whether people will identify based on what blockchain system they use. Will people start to say “I’m a Bitcoiner” in the same way that they say “I’m an American?” It’s possible. Already crypto investors seem to identify, to an extent, with which blockchain system they prefer. If this technology is integrated into a town in a mall concept, then the answer to my previous question is likely to be “yes,” especially if each town has its own blockchain to manage local operations. This idea brings us to the next issue. How do people start interacting with the local economy? Trading posts are necessary components of the economics of a Blockchain supported “town in a mall” concept. Trading posts were iconic in early American history. Dungeons and Dragons players are also probably familiar with the concept. They were part of the American frontier. But modern Americans probably haven’t had much experience with them. The closest analog in modern society would be a consignment or pawn shop. If a town in a mall utilizes a blockchain and cryptocurrency pair that’s either not that common outside of the mall, or unique to the mall itself, then there must be a way for an individual who wants to shop in the mall to get spendable currency. Therefore every mall should have a trading post, which would function as a currency exchange, a consignment shop, and a pawn shop, all in one. A person could then walk in with either USD or something else of value, and exchange it for either something else of value that the shop happens to have, or exchange it for locally used cryptocurrency. This trading post operation would also be a great place to create an identity (citizenship) and obtain any necessary hardware. In my discussion on universal basic income and beyond, I talked about the idea of having a tablet system which would integrate with the blockchain and cryptoasset ecosystem in order to allow access to a whole host of features. The trading post is a perfect place to pick up such a device, or register an existing device with the ecosystem. The integration of blockchain citizenship with the concept of the town in a mall idea essentially turns malls into micronations. Every person who lives in the mall-town will basically be a citizen of the mall-town. These ideas however can be expanded to larger scales. The mall-town idea is great, but I would really eventually love to see entire cities run this way. The mall idea is simply a prototype for self sufficient smart cities, surrounded by agricultural districts, and connected to one another through high speed transportation. The post The Socioeconomics of Mall-Towns appeared first on Politicoid. Imagine being an early farmer, working along the Nile. Times are tough, and your plot of land isn’t producing nearly as well as you need it to in order to feed your family. You have a neighbor further up the river, and his land is performing much better. You need to feed your family, but all you have is your poorly producing land. What are you to do? Your options are limited, so you give your land to your neighbor, and in return, he agrees to let you work the land in return for some of the food. Over time, more neighbors do the same, and the quality land owners acquire more and more land, and more and more workers. Eventually the very few winners end up with extensive wealth, while the rest of the population has little. This story, while not exact, is likely similar to how events played out in the early pre-dynastic period, as the Egyptian population moved from an egalitarian society to a hierarchical one. And it is in part for this reason that currency is so useful. Here we can see that wealth accumulation in no way relies on money. Nor does the obsession with wealth accumulation necessarily derive from the existence of money alone. It existed long before money did. But money has helped us, in many ways, and one of the reasons why this kind of story does not play out the same way today is because of money. Money and currency are often used interchangeably, and in this discussion, I’ll probably use both in similar ways. But there are some distinctions. Money is any unit of exchange within a transaction. A system of commonly accepted money is called “currency.” And in many ways, a currency is simply just a form of barter. Instead of bartering a piece of land for food, one could barter a piece of land for a number of pieces of gold. Then that gold could in turn be bartered for food. But unlike with other forms of barter, a currency allows us to separate our transactions across time and space. Instead of selling our piece of land for say 26,000 pounds of beef, which is going to go bad over any reasonable amount of time, we can sell our house for $100,000, rent an apartment for $1,000 a month, and buy food for $200 a month. And that land which we sold may have been in New Jersey, while we’ve long since moved to San Diego. While this example is somewhat contrived, it shows just how much freedom we can obtain from the existence of a system of commonly accepted money. And money has existed for a very long time, in some form or another. Precious metals, shells, even tea have been used as mediums of exchange. While not as old as money itself, monetary theory dates back a couple of thousand years. Plato and Aristotle were among the first to develop theories of money, and their two viewpoints couldn’t have been any more different. Aristotle thought that, among other qualities, a currency should have intrinsic value. It should be a physical asset that has its own value, outside of being used as a currency. Meanwhile, Plato thought that money should be abstract, and act solely as an intermediary in the exchange process. In many ways, Plato would be happier with the monetary systems used today, rather than gold standards and other systems of hard assets as currency. Fiat currency is often defined as currency without any intrinsic value. However, intrinsic value can be difficult to define in and of itself. Instead, I prefer to define fiat currency as any currency which part of its demand is derived from other means beyond its use as a currency. The US dollar, and essentially every government currency, is therefore fiat. The only value that the USD has is the value provided by its acceptance as a currency. It’s interesting how the existence of money has obscured so much of what we do. It’s also interesting to see how people think about money. It’s fairly different from the way we think about other components of the economic system, including other commodities. But currency is just a universal item of barter. And it’s very important that we have one, or many, systems of currency. Money, as well as law, separates employees from employers. It separates consumers from providers. And for this reason, economics is overly complicated. Consider the employee. The employee provides labor to the employer. The employer in return pays the employee. If we didn’t have money, we might have a system like the following instead. Suppose that you were a baker, and you baked a lot of bread for a restaurant. In return, you were able to eat means at that restaurant. In this situation, there is no employee or employer. But suppose that you were tired of eating at that restaurant. Your only option would be to stop trading bread for meals. With money, on the other hand, you can provide your bread to the restaurant, and in return, the restaurant will give you money. Now we have a division between producer and consumer, and between employee and employer, or at least contractor and contractee. “Money is the root of all evil” is a misinterpretation of the biblical quote “the love of money is the root of all evil.” But even then, it’s not that liking money and wanting more of it is bad. It’s really part of our own human nature to wish to acquire wealth and be successful. The problem is when the acquisition of money becomes the primary goal, especially when that money is fiat currency, as there is nothing of value to the money, aside from its use as a currency. But in many ways, money is able to allow more people to accumulate wealth, and be better off. Instead of a few people amassing almost all of the resources in a community, the average person can make a decent living. Again, money helped a lot to get us to where we are. So money does not imprison us. It frees us. The post Money and Wealth appeared first on Politicoid. What happened in New Zealand is tragic. It’s always incredibly sad when people lose their lives to disease. And let’s not kid ourselves, violence is a disease. But for a long time Australia specifically has been touted as a measure of success for gun control. And even New Zealand has relatively strict gun control laws, which require sponsorship and interviews in order to obtain a license. But now an Australian has perpetrated a massive shooting in New Zealand, and the nation is shocked. But I’m honestly not surprised. There were a number of factors that provided a false sense of security, all of which equate to bad science. The first issue is assuming causation when all that could be determined was correlation. In my original article on the myth of Australia’s gun control success, I mentioned that gun related fatalities had declined considerably before the implementation of its gun control legislation. The second factor involved was a failure to recognize the mathematics of rare events. Mass shootings are rare events. How rare depends on a number of parameters. Rare events are difficult to analyze, because they happen so infrequently. In this case, the gap in mass shootings in New Zealand and Australia may have been due to the rarity of the type of event, rather than legislation. 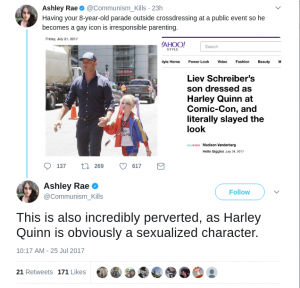 Consider another example. Suppose we have occasional flooding in a region. Maybe the region experiences a flood, once every five years, on average. Now suppose that a bunch of people think that they can just ban floods. So they implement a law preventing these large scale floods, and there’s no flood for ten years! Can we say that the legislation worked? Mathematics can help is decide, if we recognize what’s happening. The type of process discussed here is a type of Poisson process, and with a few assumptions we can calculate the probability of n such floods happening in a given amount of time. λ is the rate at which the process occurs, so in this case 1/5years and t must be in the same time units. So in this case, we want to know the probability of the event happening 0 times in ten years. I won’t show the calculation, but the final result is that the probability is 13.5%, which is fairly small, but not really all that unusual. Even if the legislation did nothing to change the rate at which flooding happened, there’d still be a 13.5% chance that over 10 years, there wouldn’t be a single flood. Mass shootings are sporadic. They occur, on average, every so often, but they are fairly rare events. And even in the United States, they account for only a small fraction of violent deaths, even though America does have a gun violence problem. So in a region where mass shootings are even rarer, it’s hard to get an idea of whether there’s been a decline, unless we’re tracking a very long period of time. The false sense of security and success in Australia and New Zealand have led researchers to ignore other issues. 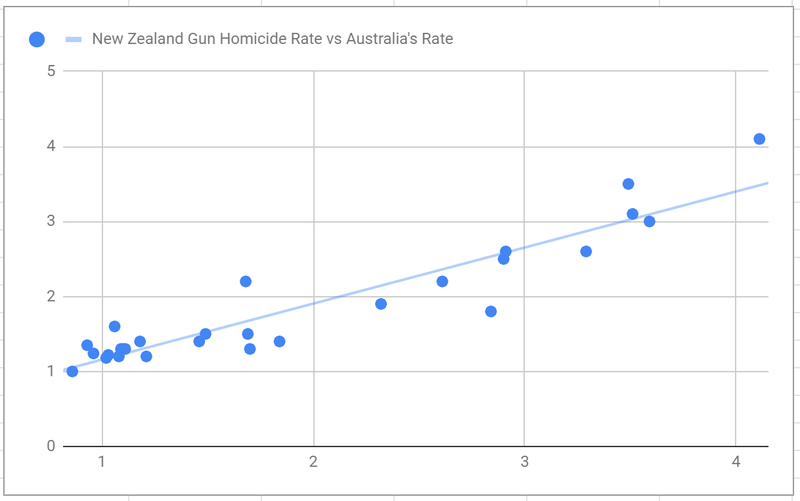 Going back to my original article on the myth of Australia’s success, I explained that the decline in gun related violence follows a logistic trend, starting with a slow decline, followed by a rapid decline, and then another slow decline. This kind of pattern is not indicative of a paradigm shift, but rather a change in social dynamic. Epidemiologists might recognize this pattern as the same kind of pattern that we see in SIR models. And that similarly makes sense. The flow of ideas across a social network is very similar to the spread of a pathogen. The final issue is that people are too obsessed with guns. While gun violence is bad, and mass shootings are bad, all violent deaths are bad. Indeed, all deaths from disease are bad, and I do consider gun violence a disease. Our goal should be improving overall health of society, and that requires analyzing gun violence and other forms of violence using proper epidemiological methodologies. But New Zealand doesn’t have as strong a gun control system as Australia! It’s true. But the process is still quite involved. It requires passing a test, being sponsored, and going through an interview. There are also a number of firearm restrictions, including magazine restrictions. But there’s another interesting point here. New Zealand and Australia are both fairly isolated, and so we should be able to see how gun control laws impact each nation without worrying about how neighboring regions affect the influx of firearms. I’m not great at producing extremely pretty graphs, but I’m good at identifying patterns and testing the validity of claims. 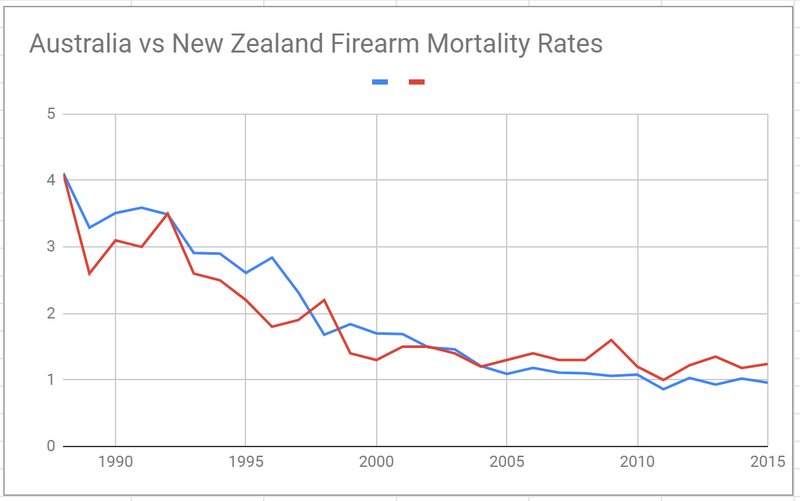 Under the above assumptions, we shouldn’t expect New Zealand and Australia’s gun fatality rates to coincide, because the laws in the two nations are different and they’re not in direct contact, making black market shipments difficult. And yet, they do correlate, wonderfully in fact. The correlation coefficient for this fit is 0.874 so it does seem like our guess on the linearity of the relationship isn’t necessarily unreasonable. I state my point this way because the goal is to try to be wrong. That’s how science works. When we can’t figure out how we’re wrong, that’s where we stop for a while, but I digress (What is Science). Moving on to the next chart, the blue curve indicates Australia’s gun mortality rate and the red curve indicates New Zealand’s. Once again we see that the trend began prior to 1996, and it did so in both countries, and both trends match pretty damn well. So it seems that in Australia and New Zealand, what we need to understand is what changed to reduce the rate of such violence. To simply claim that the law did it is unreasonable. It doesn’t explain the trend prior to 1996 nor does it explain why the trend matches in both nations, even though they had differing gun legislation. And so long as researchers focus on the false sense of security provided by gun control efforts, we won’t know. And if we don’t know what changed, we won’t know if it’s changing back, or how to stop it from doing so. The post The New Zealand Mass Shooting appeared first on Politicoid. If one of the concerns about gun sales is that there aren’t enough checks on a person’s ability to use a gun safely, there is an alternative to legislative gun control. Specifically, we can use voluntary agreements and NGOs. This discussion is going to be brief. It simply gives a rough outline for a suggestion, but it can work as the foundation for a more robust proposal in the future. Does gun control work? Maybe it will help a little, but we need to think about gun control as a potential intervention for an epidemiological problem. At least in some cases, gun control advocates use anecdotes. This includes references to Australian measures. But whether or not gun control works, we can still implement voluntary solutions, which no reasonable person should oppose. It fits into the ideal of the invisible hand of the free market, as well as recognition of the public health issues of gun related violence. To start, consider that proper training involving firearms is admittedly important. It’s reasonable to think that most people would agree with the need for training. We just shouldn’t have a legal mandate to require it. Nor should we have gun control laws that background checks mandatory. We shouldn’t have a government database of gun ownership either. But if there were a network of non-governmental training programs and background evaluation programs and stores that took part in these programs, we could have a safer environment. And we could do this all without the need for any government intervention. While it would take a while for widespread adoption, a non profit could easily be established, which would provide training, at a reduced cost, as well as an evaluation of one’s personal capacity to use a firearm safely. The organization could even be member owned, possibly with the gun stores as the members. This is voluntary solution. It is up to the individual store’s owner(s) to decide whether or not to be involved. This discussion is just gives the basic idea. So, feel free to comment using Disqus. Let us know what you think of the idea of having a voluntary association, as an alternative to a police state telling us how to handle gun related issues and other issues. The post Gun Control Alternative appeared first on Politicoid. Ignoring for the moment the constitutional issues with the FCC itself, the entity’s regulations on amateur radio (HAM) are, in some cases, horrific violations of the constitution. As some background, I have been interested in amateur radio for a long time, but I recently decided to actually bite the bullet and go for my license. You can find more about that here. I did this for two reasons. First, I like to push myself. But I also did this so that I could be considered part of the class of amateur radio operators. In this way, I can be involved in any lawsuits against the FCC, with respect to protecting the rights of amateur radio operators. The first matter to address is the need for a license at all. We have a right to utilize any means at our disposal to communicate with one another. Now, one might want to argue that failure to comply with specific guidelines could impose on others trying to also exercise their rights to communicate with others. That’s true. But these kinds of restrictions treat people as potentially harmful, from the get-go. The right to peaceably assemble is violated by this licensing rule. While we may not be assembling physically, we are assembling through an available means of communication. So long as we are not impeding someone else’s right to assemble in a similar fashion, that should be enough. But even if you have a license, there are a lot of restrictions. Profane speech may be offensive, but it is still speech. It is very likely conveying an idea, even if that idea is offensive. Therefore it is also protected under the first amendment. However, because of the semi-open nature of amateur radio, operators are not allowed to use any profanity or vulgar speech on the air. Furthermore, because the goal of amateur radio is communication, usually related to the hobby, things like playing music is also prohibited, in general. Perhaps some of this restriction makes sense, on older methods of communication. But it really makes no sense if we are using DMR, which is a form of digital communication. DMR allows for a more controlled means of communicating with individuals. Because each person using DMR is assigned a unique identifiers and the radios can be set to communicate with specific identifiers or groups of identifiers, unwanted content can be blocked out. Indeed, it would be possible to even have “NSFW” indicators in the ID so that parental controls could be enabled. Illegal search and seizure is another issue. The FCC does not abide by the Fourth Amendment. It relies on the argument that investigations into civil matters is not covered by the amendment (FCC Inspection Fact Sheet). Therefore the FCC has taken it upon itself to have the power to demand inspection of any station, without any warrant or other justification. You are required to immediately submit to a search, if the FCC demands it. Unfortunately, while there have been a number of court rulings that admit that the Fourth Amendment is not limited to criminal investigations, the courts have not yet fully recognized our protections (Justia). While I do hope to have fun with amateur radio, I have really gotten involved in the activity in order to oppose these unconstitutional restrictions. After all, you cannot just sue to oppose a law. You must be impacted by the law in order to sue. Being a licensed amateur radio operator, I will now be impacted by these restrictions, and so it will now be easier to involve myself in lawsuits related to amateur radio operations. The post Amateur Radio and The Constitution appeared first on Politicoid. The other night I got into an argument with my sister about discriminated classes, and I pointed out that one of the most discriminated classes that is almost completely ignored is left handed people. Both my sister and I are left handed, but she does not perceive any kind of real discrimination. Is it because there isn’t a significant amount of discrimination, or is it because social justice warriors don’t go around screaming about left handed discrimination? But what discrimination is there? It can’t be that bad, can it? It can. In fact, our own language is permeated by that discrimination, as are our social norms. The “right” way is the correct way. Sinister, which has come to mean evil, is quite literally the Latin word for “left.” If you are ambidextrous, you have two right hands. If you are a poor dancer, you have two left feet. Moreover, when you go to greet someone, you shake their hand, but only by reaching out your right hand. Of course there is also the obvious material issues with being left handed. The world is set up for right handed people. But issues are far more extreme than that. Research has suggested that left handed surgeons have more difficulty than right handed surgeons. There is evidence justifying the claim that people who are left handed have different brains, and yet left handed people seem to be generally excluded from research. This exclusion is not accidental. Left handed people still make up 10 – 15% of the population, but they are excluded from these studies to reduce variance. Of course, we don’t have certain forms of discrimination that we used to have. Left handed people are no longer burned at the stake or beaten into using their right hands. Of course, since left-handedness is partially genetic, past discrimination very well may have had an influence on the current state of left handed people, and may also be one reason why it is difficult to find products designed to be used by left handed people. It’s also possible that families with a tendency towards left-handedness are also economically disadvantaged because of the past, though given that only about 25% of handedness is hereditary, that might be a bit of a stretch. Of course, things have settled down a bit in the United States. In other countries, this is not necessarily the case. In India, eating food with your left hand is disrespectful. It can be quite offensive to use your left hand in the Middle East. Regardless, there is clear discrimination within our culture, against left handed people. It is embedded in our language and our greetings, as well as our production of tools and research criterion. It seems that the only reason why left handed people are not given more attention is that social justice warriors have not taken up the mantle. The post Left Handed People appeared first on Politicoid. One reason there seems to be a lot of confusion is that Pierre-Joseph Proudhon, who was one of the core founders of socialist thought, the de facto father of modern anarchist thought, and the first self proclaimed anarchist, opposed private property. In “What Is Property? : An Inquiry into the Principle of Right and of Government,” Proudhon reasonably argues that unused property is not actually private property. I express the position in a similar fashion, based on the concept of rights that I have developed over the years. Private property, in an anarchist system, is a myth. Once something is no longer in one’s position, once it is no longer voluntarily enjoyed in the absence of others, that person loses the right to it. If a person lends something to another person, the other person has a contractual obligation to return it, but to take it back by force is a violation of that person’s right to the property that he or she is voluntarily enjoying in the absence of others. Socialism is not government control. I cannot emphasize this point enough. Political talking heads use this view of socialism in order to discredit any discussion on the topic. Socialism is simply any economic system, in whole or in part, characterized by shared ownership or stewardship of the means of production. Credit unions are socialist institutions. Food cooperatives are socialist institutions. Even publicly traded corporations are socialist institutions. It is odd that socialism is characterized only by Marxism, who came after Pierre-Joseph Proudhon, and before G.D.H. Cole. Maybe it is because neither those who came before nor after cared for government, Marxists, who want government to bring about change, became the most loudly spoken group, and everyone recognizes them, and only them, as socialists. But they are not in any way the only socialists. Publicly traded corporations are also capitalist entities. While capitalism was actually a term coined by Marx, and he defined the concept with a negative connotation, modern economists do not use his definition. It is too narrow and too biased. Capitalism is generally defined as an economic system characterized by for profit ventures. A definition which is useful here is “any economic system, in whole or in part, characterized by the excess of production being returned to the system of production.” I used “in whole or in part” in both of these definitions because a common tactic is to use the straw man of demanding a dichotomous system, where either the economy is entirely socialist or entirely capitalist. That makes no sense. While small bands of families may be almost entirely socialist and even egalitarian, it would be odd to see a reasonably complicated system, with a large number of people, characterized by only one economic mode. Capitalism is not greed. While profit is a primary motivator in a capitalist system, it is normal human behavior to expect something in return for your efforts, risks, and so on. While some corporations do try to maximize profit at all cost, those entities usually die, unless they get bailed out by the government. Wealth maximization is an alternative to profit maximization, which focuses on long term growth in the value of the operation. One possible reason for the misunderstanding is that until recently, corporations were actually forbidden from acting in any way that would not be in the best interest of the shareholders. Some corporations tried to have other primary motivations, such as benefiting the public. However the courts decidedly ruled that such corporations had a fiduciary responsibility to think about the shareholders first, and everything else second. It was not until the development of a “Public Benefit Corporation” or B-Corp that for-profit corporations even could legally focus on anything other than their shareholders. Capitalism is not market economics and market economics is not capitalism. Credit unions are a good example. They are generally non-profit entities, which means that they are not capitalist in nature. However they are market entities. Credit unions charge for their goods and services, based on prices established through supply and demand in an open market. A market is any venue, whether physical or virtual, in which people get together to exchange resources with one another, and negotiate on a price of the exchange. That is all that a market is. Why people are in the market, whether it is simply to get what they need, to provide something that they think others should have, to make a profit, and so on, makes no difference. Socialism is not government control, and capitalism is not excessive greed. So why do there seem to be so many issues with each one? We see massive institutional corporations destroying small business competition, polluting, and ignoring the desires of the customers. We see nations like Venezuela crumble under economic devastation. There is something that these two classes of situations have in common: government. Regulation, protection and support of one group at the expense of another, including through taxation, regulation which stifles innovation: all of these factors are destructive to socioeconomic conditions. The legal restrictions of for-profit corporations that tried to work for the benefit of more than just the shareholders is a prime example. It is government which is the destructive element, not socialism or capitalism, which often work hand in hand. The post Socialism is Not Government Control appeared first on Politicoid.